Rock art has greatly enhanced our knowledge of our prehistoric ancestors and the Abourma site, in the African state of Djibouti, is enhancing our understanding further. These carvings which are set in a spectacular landscape, are now helping the world appreciate the distant past of society in this region of Africa so much so that it has been declared a national monument by the government of Djibouti. Despite the terrain, its location meant that the coastal region became an important trade center, and local populations who traded with merchants from Arabia and South East Asia were among the first to convert to Islam in Africa in the eight century AD. The desolate nature of the terrain, and the fact that it has some of the highest recorded temperatures in the world, means that much of the country is sparsely populated which has led many to assume that there was little of archaeological interest in the country. This assumption has been proven incorrect. Since the 2000s, a series of finds such as cairns, stone circles, fish ponds and burials, have indicated that during the Neolithic period Djibouti was populated by groups who belonged to a sophisticated Stone Age culture, despite the climate. The culture, known as the Asgoumhati, flourished around 3000 years ago and was named after the village where the first archaeological discoveries were made. This site was only recently uncovered in 2008 by a French archaeologist who was carrying out a survey of the area. The carvings he found are located on a massif (a compact group of mountains) in a desolate part of Djibouti that is now sparsely populated. The amazing number of carving at this site were made by chipping away the surface of the rocks using hand held stone implements and they cover almost 1 and ¾ miles (3 km), the majority of which are to be found in shallow caves and on smooth sections of large rock. Not only is the sheer number of rock art impressive, but the diversity is extraordinary. They portray many animals that are no longer indigenous to the area which suggest that the climate has changed dramatically through the millennia. In some of the images men are shown hunting animals, although some of the art is thought to show domestic animals, indicating that the people were not only hunter-gathers, but also pastoralists. The imagery provides insight into the world-view and belief-system of the people who carved the images as they are shown interacting with animals and nature which could represent rituals or magical practices. There are many depictions of warriors who appear to be holding bows and arrows as well as spears and shields. In some images they are shown fighting or practicing fighting, which leads to the conclusion that the Neolithic society that carved the art was possibly a war-like nation. The rock art is believed to have been created by members of the Asgoumhati culture and the depictions of life portrayed are helping experts to have a better understanding of this important Neolithic society. If the art was made by members of this culture, then it is at least 3000 years old. 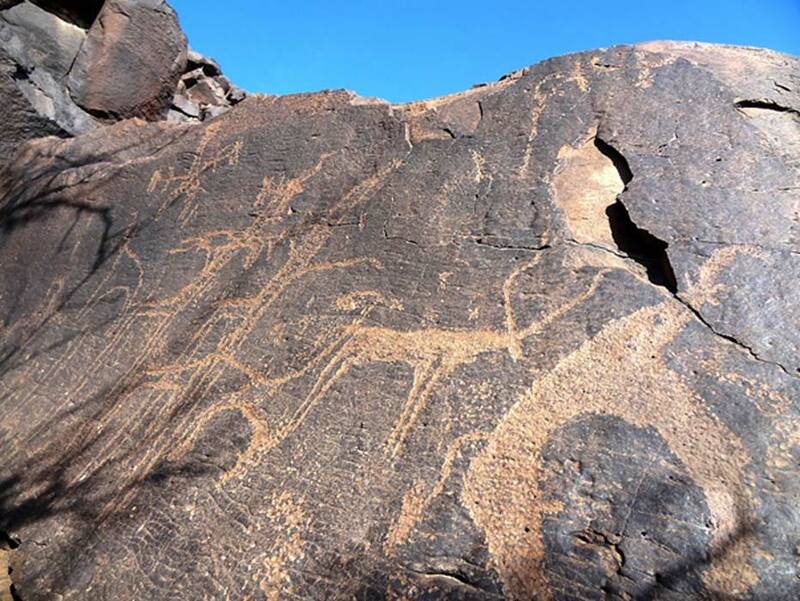 The rock art is located in extremely inhospitable terrain in the north of Djibouti and is a fair distance from the capital and 20 miles (32 km) from the town of Randa. There are few roads and it will take a hike of about 5 miles (8 km) to reach the location, although the spectacular landscape of hills, boulders, and gorges are well worth the effort. Abourma can only be accessed on foot and it is essential that a professional guide is hired as going it alone could be very dangerous given the climate and terrain of Djibouti. Poisblaud, B. (2009). Les Hommes d’Abourma (Men of Abourma) . L'Anthropologie, 113(5), 848-860.